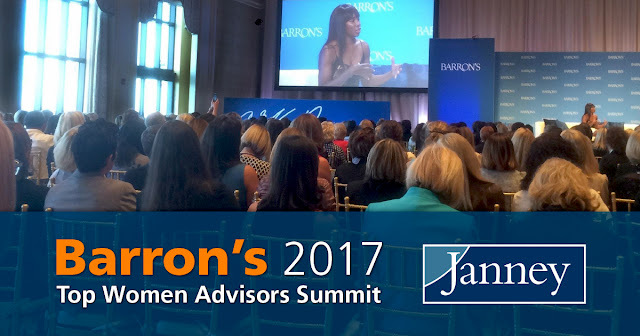 (PHILADELPHIA, PA) – December 11, 2017 – Janney Montgomery Scott LLC (“Janney”), a leading full-service wealth management, capital markets, and asset management firm headquartered in Philadelphia, PA, was honored to have ten participants attend the annual Barron’s Top Women Advisors Summit, an elite gathering of the nation’s preeminent women Financial Advisors and industry decision makers. The invitation-only conference was held at The Breakers from November 28 – December 1 in Palm Beach, FL. Representatives from Janney selected to represent the firm at this prestigious event were AnnMarie Brancato, First Vice President, Wealth Management Financial Advisor; Melody A. Filicky, AWMA®, RIS, First Vice President / Investments; Binnie S. Footer, AWMA®, Senior Vice President/Wealth Management; Anne Lurton, Senior Vice President, Complex Manager; Ginamarie Schembre, Senior Vice President / Private Client Group Financial Advisor; Clare Schwemlein, AWMA®, CEBS, CFP®, First Vice President / Wealth Management; Sheila S. Shaffer, CFP®, Executive Vice President/ Wealth Management; June D. Strunk, CFP®, Executive Vice President / Wealth Management, Satellite Branch Office Manager; Caitlin Ulmer-Long, AWMA®, Assistant Vice President, Private Client Group Administration; and Laura J. Williams, CRPC®, First Vice President / Investments. This exclusive conference was designed to promote best practices and generate new ideas across the industry. Attendees conducted workshops led by Barron’s Top 100 Financial Advisors (June, 2017) that explored current issues from business development ideas, managing high-net-worth accounts and families, to portfolio management and retirement planning.